What's more romantic than a full moon over Sabino Canyon? How about a moonlight hike up Sabino Canyon with that significant other? Or for the jock/jockette, an early morning run? For you intellectual types, impress your date with geological factoids gleaned from A Guide to the Geology of Sabino Canyon and the Catalina Highway, published by the Arizona Geological Survey. (Honestly, it's fascinating—Sabino Canyon follows an earthquake fault. Who knew?) 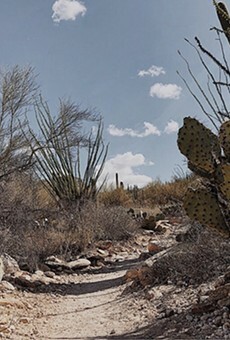 Tucson's favorite hike is whatever you make of it—romance, exercise and nature study, all in our own backyard. When the information society has got you down, there is no better place to recharge your batteries.